The Expanse is probably my science fiction series right now, and I think Cibola Burn is the best installment yet. Why, you ask? 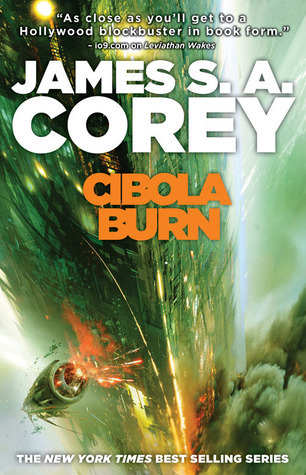 Well, unlike the previous books, which I felt started off slow but gradually built up to bigger and better action, Cibola Burn breaks this pattern and kicks things off right away with an explosive conflict you can’t ignore. The mysterious proto-molecule that somehow created a massive ring structure just outside the orbit of Uranus has turned out to be a gate leading to thousands of habitable planets on the other side. To the annoyance and chagrin of the corporation with the planetary exploration and harvesting rights, a ship of refugees have made it over and settled on the first of such new worlds, claiming it as their own and starting up their own mining operations. Violence erupts when the company finally arrives to protect what they think of as their property, with the colonists pushing back. This is how the book starts out – literally with a bang. Protagonist James Holden, deemed as the best person to act as mediator in this conflict, is dropped into the middle of things before they can escalate and both sides end up killing each other. The whole situation is a lit powder keg waiting to explode and the atmosphere could not be more intense, and this is all just within the first handful of chapters. There’s none of that “slow climb to the apex”, which is how I described Abbadon’s Gate. Here, you get to the good stuff right off the bat. But before you think all the action is front-loaded, rest assured that this is not the case. The tension continues to build and it’s safe to say that circumstances get worse for the characters (which translates to “More exciting!” for the reader) before they get better. Cibola Burn is part space colonization story and part space disaster thriller. For those reading this series who might be suffering from proto-molecule fatigue by now, the good news is that while the proto-molecule still plays a big role in the overall story, it takes a backseat to the more dramatic and more human events happening right there on the frontier planet. It’s wild and lawless territory out there, with neither side willing to relinquish control. With no real police force, no courts and no legal system, authority is determined by who has the greatest firepower, and when you’re in a region of space eighteen months from the closest civilization, that there pretty much spells a recipe for disaster. Like all the previous books in the series, Cibola Burn is told from the perspective of a handful of point-of-view characters. The cast has expanded yet again, changing up all the key players except for Holden, who as the main protagonist has kept up a constant presence in all four books now. For the first time in this series, however, I became partial to his chapters. In books 1-3, I’d always felt that Holden’s character was eclipsed by more powerful and interesting personalities (in Leviathan Wakes, by Miller; in Caliban’s War, by Chrisjen Avasarala, my favorite potty-mouthed UN politician; and in Abbadon’s Gate, by Bull) and he’d never managed to capture my attention. That is, until now. What changed? It’s not like the other POV characters here were any less compelling. But somehow, Holden definitely came into his own in Cibola Burn. As someone who’s always so sure of his moral position, it’s a new experience to see him try to compromise for the sake of keeping the peace, and when the situation devolves, his leadership skills are put to the test. In fact, all the POV characters – Holden, Basia, Havelock and Elvi — were enjoyable to read about in their own way. Compared to a relatively weaker cast in the last book, Cibola Burn was a much more engaging read for this reason. The only character I didn’t care for was Murtry – and not because he’s the villain. I notice the authors seem to have a tendency to paint the “bad guys” in this series as really BAD guys, all super evil psychopaths with terrible motives and inflexible attitudes. While it leaves little room for doubt who you should be rooting for, that doesn’t add much to the person or situation. Other characters who sometimes lack in depth is an occasional issue I encountered, but the baddies seem to have it the worst. Still, if that’s my only complaint, and it’s a minor one at that, this book is clear a winner in my eyes. Like I said, I found this to be the most exciting and powerful book so far. When a strange planet that no one understands turns against colony and corporation alike, the notion of people putting aside their differences to help each other survive becomes a central theme, and all the while the clock is ticking. It’s really no surprise that the series is heading to TV, being the perfect mix of science fiction chills-and-thrills with the passion and weight of human drama. Fans of The Expanse will eat this book right up. And if you haven’t started this series yet, what are you waiting for? A review copy of this book was provided to me by the publisher in exchange for an honest review. My thanks to Orbit Books! I’m sorry to say I’m not familiar with this series. (Why do there have to be SO MANY BOOKS???) I’m getting flashbacks of Battlestar Galactica, erhaps? You might not be as far off as you think. This series is coming to Syfy – and I hope it will find success like BSG did, unlike some of the network’s more disappointing shows. I’ve been yearning to read ABADDON’S GATE recently but I really want to save it for my vacation around the 4th. If I read it now, I could jump into CIBOLA for vacation – but then what would I do for the 12 month wait for the sixth? AHH. Now that i know I can anticipate the first ones starting off slower and this one coming on strong and that it’s your fav SF series currently there is no way I can hold back now!! AHHHH so much to read and so little time. There are some in the second, but not as significantly as in the first. This is easilyu favorite SF series right now. Sorry, this one got butchered on my phone. But the series is amazing. I’m with Tabitha on this one… add this to my must read list! Well after this rave review, I don’t know what I’m waiting for! Obviously I need Leviathan Wakes, ASAP. Just add my name to the list of ladies hopping onto this band(space?)wagon. Yeah, I can’t think of any other sci fi series I’ve been following this closely and faithfully at the moment! I have got through two. Third one soon. Enjoy! Abbadon’s Gate was probably my least favorite book in the series overall, but it has an epic ending. I’ve had Leviathan Wakes for quite awhile so I think I’d better read it soon, Mogsy! Thanks for the push!